There’s no scarcity of folding chairs that can be packed into neat and compact applications for clean convey into the awesome outdoors, with the 2-legged Bip and bottle-sized pass Chair just a couple of new examples. The HoverChair may take slightly extra work to p.c. onto your back, but promises splendid levels of consolation with a striking layout, breathable materials and an optionally available foot hammock to relaxation those weary legs. The HoverChair is an progressive and clean-to-use hanging chair that measures 15.7 x 9.8 inches (packed) and weighs 3.9 lbs. The usage of the compact design and protected wearing bag, you could effortlessly bring it for diverse outdoor activities. Using 10ft adjustable rope and included carabiner, you can easily hang your HoverChair in the air. And the air-cushioned seat and breathable back support let you enjoy a leisure time with your favorite books and beverage during your adventure. Furthermore, it comes equipped with several pockets on both sides in order to hold your smartphone, water bottle, and other items for easy access. An optional foot hammock brings the comfort to a new level. Moreover, it’s machine washable for easy cleanup. 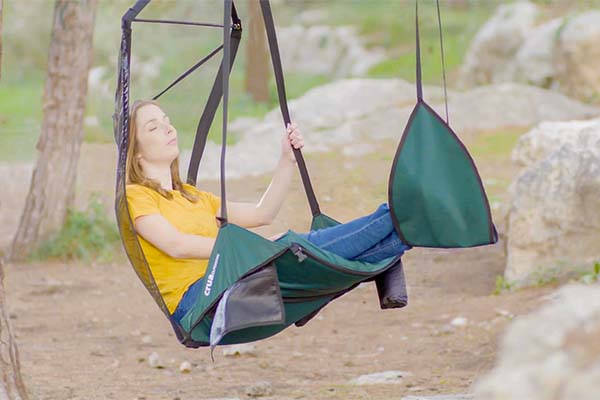 The HoverChair is the latest item from gear maker Crua Outdoors, which successfully crowdfunded its Koala hammock on Kickstarter last year and its Clan tent system before that. The company has again returned to the platform to get the HoverChair into production, where early bird pledges of US$49 will have one sent your way in June if everything goes to plan, while $59 will see the hanging foot hammock thrown in.